I remember that the trailers for the first move weren’t all that impressive and in the end we went to see the movie because we had nothing else to do and wanted to get out of the house. In the end it was well worth the effort. With number 2, again the trailers left us cold, but remembering our experience with movie 1, we thought we’d risk it. Well, it suffers greatly from sequelitis. While admittedly it was better than the trailers would have led us to believe, it didn’t even come close to the quality of the first. It felt in many way as if they were merely making a sequel to cash in on the name. The story felt a little slow to get going. At one stage it also felt like little more than a montage of creatures the writers were able to create from food. It felt strange that the hero would still believe he was there to stop the food animals from learning to swim when any number of them were already water based. It was also strange that even the most vicious of these creatures turned out to be friendly to anyone not working for the evil inventor dude. There seemed to have been an underlying vegetarian vibe to the movie as the animals don’t even seem to feed off of each other. (well, there were butter frogs and mosquitoast.) It was all right for the pickles to eat fish though. And the bad guy is the bad guy because he wants to turn Food animals into food. 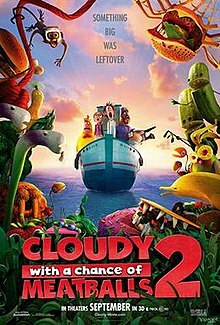 In the end though its probably a relatively good movie for children and there are a few subtle jokes to keep the parents happy. Third week of the month, so The Vapors also added. I think it fits there better. Obviously the chapter isn’t finished. I’m not sure I like it. I’ve been having trouble finding the time to work on the book lately. I’m also tempted to put it to the side for a few days and start a different book. Ideally I’d like to leave that one for after this one though. Anyway, about 200 words and that’s all. feels a lot better. I think I might leave it here and press on with the next chapter tomorrow.